2'6'' tall and 2' wide. 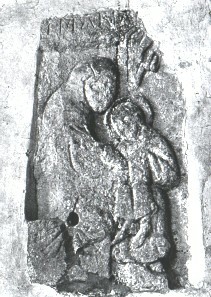 Slab with Blessed Virgin Mary and child. The Virgin is wearing a hooded robe and the child is on her knee. The hand of God is in the top right corner of the piece above the haloed head of the child. Taylor, H.M., Taylor, J., Anglo-Saxon Architecture 1st, Cambridge University Press, Cambridge (1965) Architecture, Sculptures, Anglo-Saxons, England..